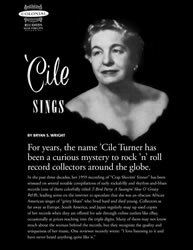 For years, the name ’Cile Turner has been a curious mystery to rock ’n’ roll record collectors around the globe. In a career that spanned the 1920s to the 1970s, Turner established herself as a versatile performer: she was a historian, storyteller, and consummate musician. She composed, sang, and played the piano, guitar, drums, pots and pans, and anything else she might find useful—and she did it all with exceptional skill. Throughout her life, she was particularly drawn to the folk music of African Americans and for a time became nationally known as one of the music’s foremost experts and performers. She appeared on records, radio, and television. She was invited to perform at the White House. As a white “Virginia lady” championing the music of African Americans in the still-segregated South, Turner challenged conventional assumptions about women’s roles in society in the early twentieth century. As a young woman, she frequently found herself at odds with her parents, who disapproved of her performing career, insisting that a woman’s place was in the home. Still, Turner’s passion for the music and love of performing drove her to continue her efforts. Bryan S. Wright is a Lynchburg native and 2005 graduate of the College of William and Mary. Currently, he is pursuing a Ph.D. in historical musicology at the University of Pittsburgh, where his research interests range from Renaissance sacred motets to American ragtime and early jazz. This article, edited for Lynch’s Ferry, has been adapted from Wright’s essay accompanying the two-CD set of ’Cile Turner’s recordings, Makin’ Glory.